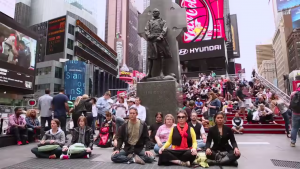 If you are either a resident or visitor in New York City, you won’t have to search very hard to find one of the growing number of centers, classes and public spaces where you can drop in to meditate. In my latest piece for The New York Times, I explore the who, the why, the how, the when, and the where. When a photo of a wall covered in lush green foliage showed up on Grace Clarke’s Instagram feed, she felt an immediate urge to track it down. Stressed out and headed to a meeting at Madewell, where she works as a social media copy editor, Ms. Clarke clicked on the geotag and discovered that the wall’s location was on East 8th Street in Manhattan at a meditation studio called MNDFL, which opened in November 2015.